Explanation: The recognizable profile of the Pelican Nebula soars nearly 2,000 light-years away in the high flying constellation Cygnus, the Swan. Also known as IC 5070, this interstellar cloud of gas and dust is appropriately found just off the "east coast" of the North America Nebula (NGC 7000), another surprisingly familiar looking emission nebula in Cygnus. Both Pelican and North America nebulae are part of the same large and complex star forming region, almost as nearby as the better-known Orion Nebula. 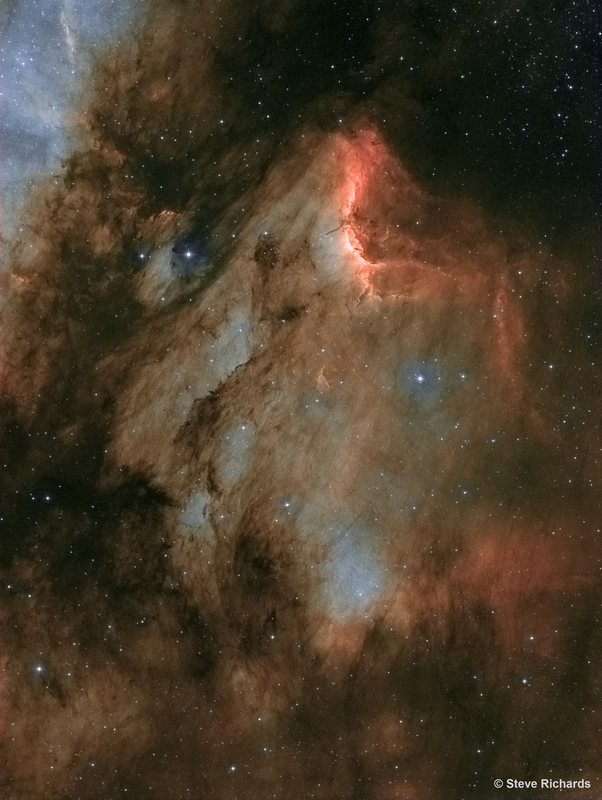 From our vantage point, dark dust clouds (upper left) help define the Pelican's eye and long bill, while a bright front of ionized gas suggests the curved shape of the head and neck. This striking synthesized colour view utilizes narrowband image data recording the emission of hydrogen and oxygen atoms in the cosmic cloud. The scene spans some 30 light-years at the estimated distance of the Pelican Nebula.